Shopify - How to add manual Shipping Methods in Shopify? You need to set up a Shipping Zone with Price Base Shipping Rates. Here are the setting we used for our test store. 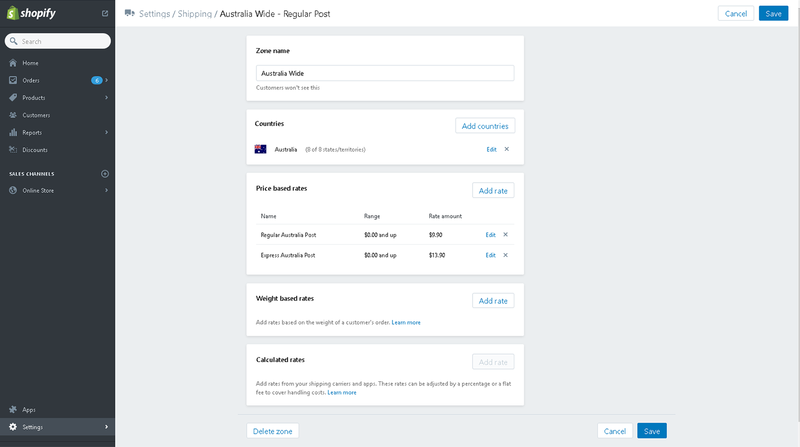 See the image above, and use the words "Regular Australia Post" for regular shipping, or "Express Australia Post" for express shipping. If anyone knows a way to Calculate Shipping by number of items, please let us know. amount (0.1kg for example), and therefore making weight based rates of 0.0-0.1kg = $7, 0.1-0.2 = $8, etc. Here is Shopify's Tutorial video for adding manual shipping rates. Related articles Woocommerce: How to Add Shipping Options to Woo? International Shipping: Do You Ship Products Overseas? Fold and PolyBag: What does the shirt look like in the package? Shopify - How to add Variants to your Shopify store?